We love a good curry here at Honeywell! Of course it’s lovely to sit back and treat yourself to the occasional takeaway from your favourite curry house but there’s something to be said about creating something delicious with your own fair hands and filling the house with it’s delicious aromas! 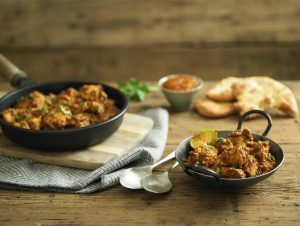 The obvious bonus is that this recipe likely to be significantly cheaper to make than your usual “go to” take away curry and it’s also likely to be a fraction of the calories too! This recipe is super simple to whip up for a yummy midweek meal for the family or makes a great Saturday night treat (especially when it’s teamed with a nice cold beer too!). While I’ve added in 2 red chilies to the recipe (we like bit of spice!) you can leave out the seeds to make a milder version or just leave them out altogether if you wish and just enjoy the lovely aromatic spices and creamy coconut flavours. We love to use a 50/50 mix of both chicken breast and thigh meat, this gives you the best of both worlds! Lovely lean breast meat but with the delicious flavour from the juicy thigh, you could use all thigh or all breast meat if you wish, thigh meat will be higher in calories and breast meat lower, but that’s personal preference! We love to serve this with fluffy rice, a good dollop of mango chutney and some naan bread to share! Dice the onion, crush the Garlic and grate the ginger. Heat a little oil in a pan on a medium heat (coconut oil is great to use but you could use a nice rapeseed oil too). Add the mustard seeds, chillies and curry leaves to the pan. The mustard seeds will start to pop, at this point add the onion, ginger and garlic. Cook for about 5 minutes until they have softened taking care to not let the garlic burn or stick, turn the heat down if necessary. Add the Chicken to the pan and brown all over for a couple of minutes. Add the Cumin, Turmeric and Coriander to the pan, followed by the tomatoes and coconut milk. Add a little water (about a coffee cup full). Simmer for about 5 minutes. Season with the salt to taste and simmer for 30 minutes on a medium to low heat. This recipe freezes wonderfully! Why not double the recipe and pop a portion in the freezer for one of those days when you have no time and need something delicious, healthy and quick! Just take the curry up to the point of adding the spinach, you can add this when reheating the curry.